Google has partnered with Starbucks to tout its Google Play Music service that was announced during its developer conference. 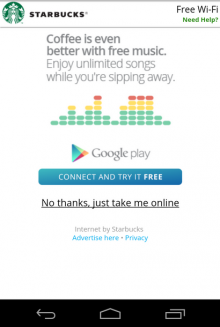 The search company says that customers can enjoy unlimited music through its service as they sip away on their beverage. In a posting on its Google+ page, the company stated that customers can have complete access to Google Play’s library of songs and audio tracks while they’re sitting down. What’s still unknown is exactly how long this promotion is going to last. Currently, Google has a promotion going whereby anyone (even outside of Starbucks) can listen to songs free of charge in a 30 day trial period. After that, it’s $7.99 a month, if they sign up before June 30. It’s surprising that Google has offered to pay for WiFi at Starbucks. After all, it’s already free thanks to an agreement with AT&T, but in the background, most likely someone was paying for all the bandwidth. In this situation, Google appears to have taken on the financial burden in a sponsorship capacity. Of course, the landing page that customers see when they successfully log on to the WiFi at Starbucks gets an enormous amount of traffic so it’s also not far-fetched to believe Google electing for a giant banner to appear. The deal is certainly a bit of a blow to Apple as well. After all, the coffee company struck a deal back in 2007 with Apple to enable customers to easily and wirelessly find and buy music through its iTunes music store. Of course, it’s on the heels of Apple’s launch of its iTunes Radio station at its Worldwide Developer Conference to take on Spotify and Pandora.